A different version of this post was originally published on McBreen Marketing. Let’s face it, there’s some tired SEO terminology out there. In this fun post, SEO maestro, Eric Enge wrote a comment that captured my attention. And his comment helps be frame my approach using the magic mix of modern SEO and branding. 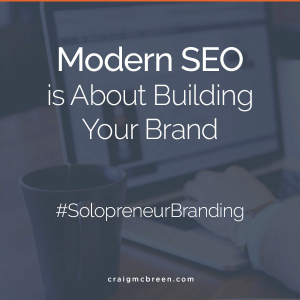 Modern SEO is about taking a broader view of how your brand is perceived online. Valuable content is the core of a modern SEO strategy. These days, SEO is about extremely useful content. The ever-changing ways in which Google indexes content means that really, really good content—content that is relevant to your brand—will continue to rise. In the past, SEO was about refining keywords, developing a backlink strategy, and for some, gaming the system. Clearly show your expertise with first-rate content tailored to your ideal customer. The wonks at Google are continually refining, and these constant updates translate to a more extensive view when it comes to how customers make their buying decisions. This more comprehensive view means that things like value, integrity, and even creativity are rising to the top in the land of search. Here’s a great little rundown of Google’s major algorithm updates from Search Engine Land. Modern SEO, search, and why branding matters more than ever. You want potential customers to find you, get to know you, come to like and trust you, and then buy from you. But the problem comes with a prospect’s unlimited search options. And their searches are more purpose-driven than ever! Google calls this Path to Purpose. Content that is personally relevant to your prospects is the THING that engages them. So, your Brand Purpose is key to your prospect’s Path to Purchase. That, my friends, is why branding matters more than ever. I’ll get to how this applies to SEO, but just know that branding and SEO go together like peanut butter and jelly. SEO is now a fully fledged branding and marketing medium. Your customers want information now! They’ve been conditioned to expect a world of information to open up at their fingertips. That’s why SEO is no longer a mere tactic, but a medium intimately bound to branding and marketing. As search engines evolve into powerful “answer engines” understanding is core. A consistent stream of quality content. And studies have shown that well-written long form content works best. This “stuff” is what the search engines want to see. The bullets define how your prospects search for your products and/or services. And they define why SEO is now a channel that needs to be a key component of your branding and marketing. Your key to a SEO strategy that works? Branding done right. Brand traction is the key to a long-term SEO strategy that works. SEO is long play. And to make SEO work for you, you need to be ready for a marathon. And to make this long-haul SEO thing work for you, you have to have powerful brand as your hub. Mark Traphagen knows SEO. And he often writes about the importance of having unique content that stands out from the competition. In the three marks of great content, Mark details the importance of writing great content that aligns with your brand and your customer’s needs. 1. Write helpful, credible, and engaging content that earns you the right to market. What Jay Baer calls Youtility. And, in Mark’s world, he recommends starting with your business goals, not the conventional wisdom of “starting with the prospect in mind.” Because this content model, one aligned with your brand, will help you find the best customer opportunities. 3. Put your own spin on content to make it stick in the reader’s mind. He writes you don’t “have to completely reinvent the wheel” just bring a fresh perspective on it. Your voice! To me, Your Voice is all about Your Brand! Don’t think like a marketer. Think more like a very creative teacher, you know that cool teacher that the students love and wins all the cool awards. She makes the other teachers jealous because she is so damn good! Be that teacher when you create content. When it comes to marketing your business, there’s an innate resistance in people that has to be overcome. And that’s exactly why you need a brand with purpose. And your purposeful brand must to be aligned with your SEO strategies. According to Mark, you need to first think about your business goals. Then think like your prospects and customers so you can build a bridge to connect what is relevant to your brand and the things that matter to your customers. Here’s how any business owner should position their brand. Clearly and concisely define what you do, what makes you unique, and exactly how you will help your ideal customer. That’s a crucial first step to branding but brand-building is something that is not always a part of the SEO conversation. To grow your business you need a strong brand presence. To stand above the competition, your brand needs to be clear, unique, and resonate with the right people. Most business owners know how important SEO is to their success but don’t realize focused branding is key to an effective SEO strategy built to attract your ideal customer. So, how do you build your brand and improve your SEO? Represents the goals and values of your brand. Resonates with the right prospects and customers. And is built not only with a focus on the right people but also the search engines. Businesses that get people to know, like, and trust them, and buy from them, produce content that shows the relevancy and authority Google likes. SEO is not dead. Heck it’s just getting started. But for it to work, a strong brand is key. Step one is positioning your brand for success. Build an unmistakable brand then weave it into your SEO plans. Your brand will be a beacon projecting the trust, quality, and authority signals search engines love. You’ll climb in search engine rankings. Your ideal customers will find you. And the happy marriage of Branding and SEO will help your business thrive. Hi Craig, thank you for sharing such great strategies of SEO. It is helpful for those who have small business and want to grow their business and build brand name through digital marketing. We know that developing a personal brand on the internet is a challenge, getting an image and a name to have a high level of authority, on the web or on social networks, is something that requires a lot of effort. I see you have a huge following here. I am glad I found this site. I think I am getting best ideas from your blog. Thanks for sharing. SEO is one of the major factor to boost-up the business. If you won’t the invest SEO you can’t make brand your product. SEO is more qualified than many other marketing strategies, resulting in cost-savings for companies. digital marketing recently posted..Should you use Digital Marketing Content in Emails & Website? Hello there Craig, thank you for sharing such extraordinary techniques for SEO. It is useful for individuals who have an independent venture and need to develop their business and construct a brand name through computerized showcasing.